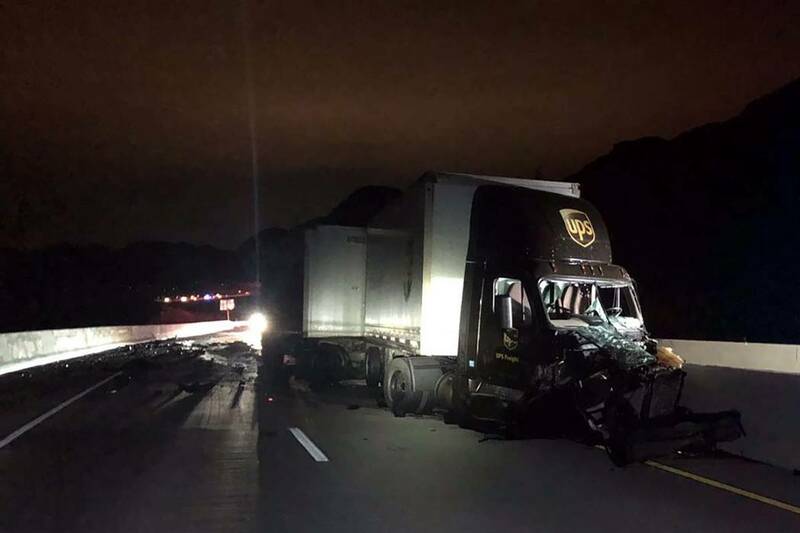 (Nevada Highway Patrol) A UPS tractor-trailer sustained severe damage in a head-on crash with another vehicle near the Hoover Dam on Interstate 11 on Tuesday, April 9. 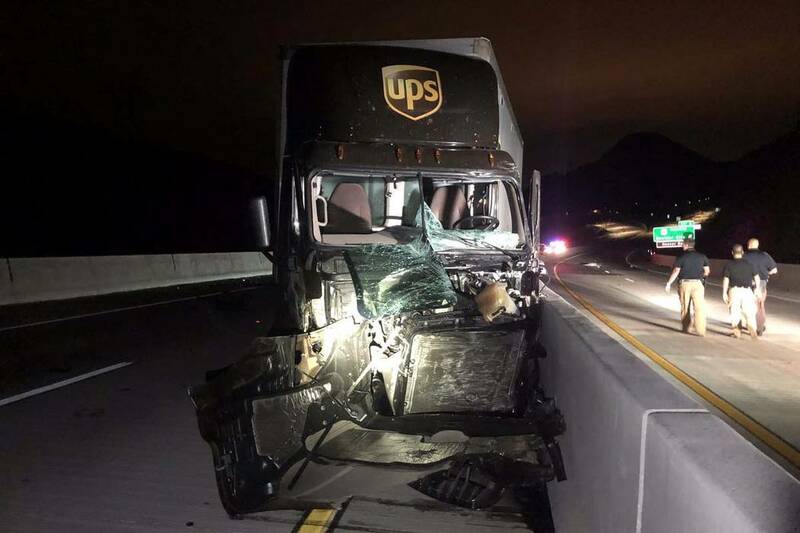 On Monday, April 8, shortly after 3 a.m., Trinidad D. Flores, 29, of Victorville, California, was driving a U-Haul truck north in the southbound lanes of I-11 outside of Boulder City near Hoover Dam. She hit an oncoming truck, according to Nevada Department of Transportation spokesperson Tony Illia. Unlike past accidents, confusing signage was not to blame as the driver was driving the wrong way for extended period of time. The Clark County Coroner’s identified the victim and, as of Wednesday morning, her cause and manner of death were still pending. The UPS driver was hospitalized but is expected to live. Witnesses described the accident scene as gruesome and said there was a massive fire ball about 25-30 feet high after the collision and people drove through the debris from the vehicles. Both directions of the highway were closed for hours as debris from the crash and a diesel fuel spill had to be cleaned up. The 15-mile stretch of I-11 runs from Henderson to Hoover Dam and goes around Boulder City. This accident is the third fatal one since it opened in August 2018. The suspected causes include speed, driver impairment and driver error. In September, Illia said NDOT was working with Boulder City and the Regional Transportation Commission of Southern Nevada to develop signs that clearly show the way to Lake Mead and Hoover Dam as well as Kingman, Arizona, and Railroad Pass Casino. According to Boulder City Communication Manager Lisa LaPlante, RTC completed their sign installation in November, and NDOT installed their signs at the beginning of March. Las Vegas Review-Journal Reporters Mike Shoro, Marvin Clemons, Jessica Terrones, and Katelyn Newberg contributed to this report.